2018 was another rough year for LG. The mobile division lost over $700 million last year despite releasing four flagship-caliber phones. LG, however, remains confident and believes improvement will be seen in 2019, starting with the LG G8 ThinQ. However, based on early rumors, they might see more of the same. In a world where phone leaks usually almost everything months before devices are announced, the LG G8 ThinQ is an anomaly. Despite a potential announcement date of February 24, there haven't been many credible leaks involving the flagship. Maybe LG is taking extra precautions, or perhaps user interest is low, but compared to the Samsung Galaxy S10, we know just about nothing about this device. However, the little we do know isn't promising, showing LG is essentially keeping last year's body and filling it with this year's specs. The LG G8 ThinQ is everything you love about the G7 ThinQ, but with updated specs and, potentially, facial recognition. Unfortunately, this comes at a cost, with rumors indicating this might be the most expensive G series device yet. Rumors indicate the LG G8 ThinQ will have a 6.1-inch display. It will once again house a large display notch, but this time, the notch will house more than just the camera and earpiece. It will have an aspect ratio of 19.5:9. There is a rumor that it will use a sound-emitting OLED in lieu of a speaker, but we are skeptical, as AndroidHeadlines has reported that LG is reserving OLED for the V series and using LCD for the G series. Based on several leaks, we know the LG G8 ThinQ will more than likely sport a dual rear camera. Our guess is one lens will be LG's signature ultrawide angle lens. The second will either be a lens with a standard field of view or a telephoto lens. The LG G8 ThinQ will be equipped with a rumored 8 MP front facing camera, which is pretty standard. The interesting part is the second sensor, a Time-of-Flight (ToF) camera which could possibly bring facial recognition to LG devices. LG partnered with Infineon Technologies AG to bring a ToF sensor to the G8 ThinQ. The camera and sensor chip process 3D point clouds, the same technology used by Huawei and Apple to produce 3D face scanning. In LG's press release, the company all but confirmed the sensor will be used for a Face ID-like 3D facial scanning feature. The camera can capture infrared light, making Face Unlock possible even in dark areas. This would make LG the third Android phone with similar technology and a way to both justify the rumored high price and combat the years of declining sales. This same technology will also power the G8 ThinQ's touchless gestures. The ToF sensor will measure how long it takes for infrared light reflected off a subject to return to the sensor, and used the data to calculate depth. With this data, it will able to operate similarly to Microsoft's now dead https://[www.youtube.com/watch?v=pzfpXAbQ61U Kinect, allowing you to navigate your phone without touching the screen. The G8 ThinQ will more than likely come with the latest SoC from Qualcomm, the Snapdragon 855. This is Qualcomm's first 7 nm chipset. Benchmarks show this chipset outperforms Huawei's Kirin 980 (which is also 7 nm) and is very close to the performance of Apple's A12 Bionic chip. So far, we don't know what storage and RAM configurations will be available for the G8 ThinQ. However, based on past models, we expect a minimum of 4 GB of RAM and 64 GB of storage for a base model. There may be a G8 ThinQ+ model which increases the RAM to 6 GB and the storage to 128 GB. The big news is the new Crystal Sound OLED panel, a new technology which uses the screen as an audio amplifier. LG developed the technology where the OLED panel acts as a diaphragm, vibrating the entire surface to produce audio. Additionally, with the inclusion of a bottom firing speaker, the G8 ThinQ should pack another upgrade, stereo speakers. LG confirmed a return of the Hi-Fi Quad DAC which all but confirms the return of the headphone jack. Additionally, they will continue to support MQA, or Master Quality Authenticated, a hi-fi audio format which provides uncompromised high-quality sound at a much more manageable file size, making it easy on data plans. Additionally, Boombox Speaker will return, the feature introduced last year which uses the internal space of the phone as a resonance chamber to amplify bass and overall volume. Rumors have it that the G8 ThinQ will include a 3,500 mAh battery. This should significantly improve the battery life of the G8 ThinQ over its predecessor, which was limited to 3,000 mAh. There are no leaks on whether the G8 ThinQ will support fast charging, but we assume it will, just like its predecessor. It appears that LG is bringing back the same design from last year's model with a glass back and front, along with an aluminum frame. The glass on the back should once again allow for wireless charging. As with all Android phones released in early 2019, the LG G8 ThinQ should come preinstalled with Android 9.0 Pie. It also should include the latest version of the LG UX skin. With almost a year under the LG Software Upgrade Center, we have to believe LG will finally improve its track record on updates starting with the G8 ThinQ. We are crossing our fingers this is the first LG device to receive software updates (for Android 10) within the year. According to LG, they are saying "goodbye to touches." A teaser video are in Jan 2019 showing off what appears to be new air gesture controls that don't require you to touch the screen. 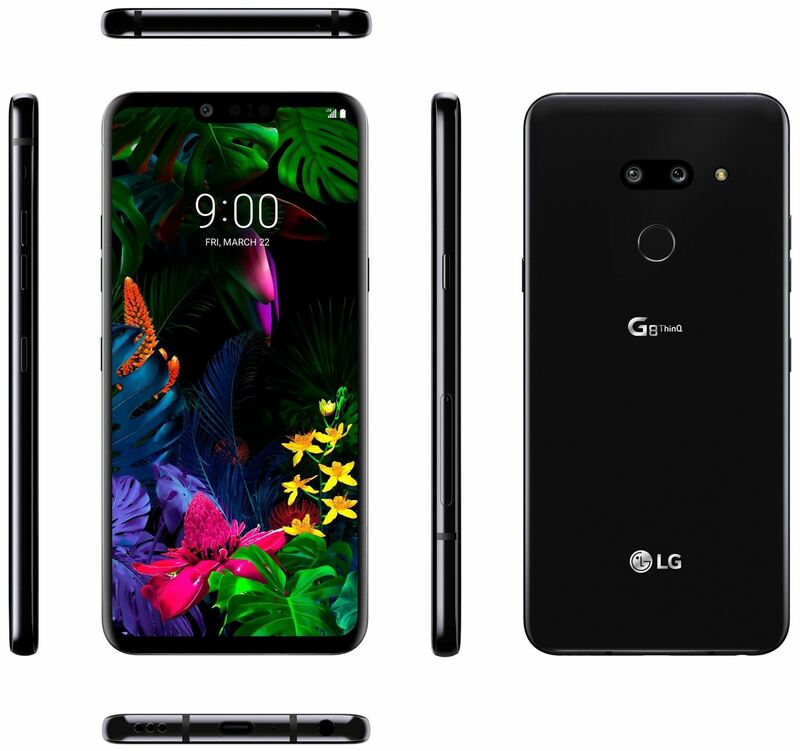 According to Redditor livedadevil, the G8 ThinQ will be priced at CAD 1,199.99. When converted to US dollars, we are talking about a price tag around $899. This would be a $150 increase for a phone, which on paper, looks to be a small upgrade from its predecessor. Hopefully, this isn't true. All signs point to LG announcing the phone during Mobile World Congress 2019. LG has an event on February 24th and it appears this is when they will announce the G8 ThinQ. As for its actual release date, we expect sometime within a month of its announcement it should arrive in stores, so before March 24th.